The Team Building Agency introduces the Centre Mont-Royal to our many valued clients! 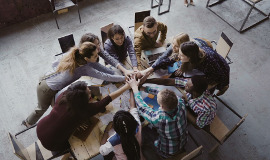 Team Building has become an integral part of a company’s interest in aligning their employees with a shared purpose that carries from their team building activities right back to the office. Having a sense of “team” is long lasting and has proven itself to be instrumental in improving individual job performance as well as group performance through cooperation and sharing knowledge. That is why Centre Mont-Royal wants to offer a turnkey service to its clients by offering Team Building activities, through a new partnership with the Team Building Agency. We are very happy to collaborate with the Centre Mont-Royal for your Team Building events. Centre Mont-Royal is a complete service venue with 17 spaces accommodating groups from 10 to 800, including a state-of the-art theatre for guest speakers and performances. As well, guests can enjoy meals prepared by Executive Chef, Yves Malenfant and his impeccable brigade. From breakfast to gala dinners, CMR does it all. Furthermore, benefit from working with the Team Building Agency a Training Bodies Organization Accredited by CPMT. Working with an accredited organization allows you to have eligible training expenditures towards “Loi sur les compétences”– Law 90-1%. The Team Building Agency and Centre Mont-Royal are looking forward to meeting you and helping you turn an ordinary meeting into an extraordinary experience! For more information on Team Building Events at CMR, contact us at info@AgenceTeamBuilding.com or call us at (514) 963-8326.